Fly Casino now has an amazing new game with 50 paylines, stacked symbols, stacked wilds. The game is not called Streak of Luck for nothing; this because of the free spins feature. You have to get 4 or more winning spins in a row to start the free spins feature. The more winning spins in a row, the more spins you will receive, up to 60. If you have 11 winning spins in a row you win the progressive jackpot!!!! 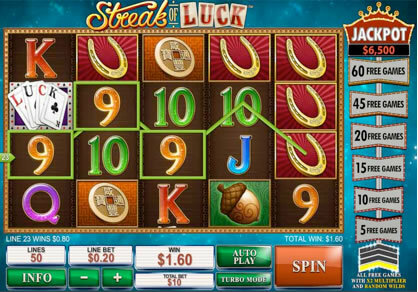 Streak of Luck also offers you a dice bonus game. When you get the bonus symbol on reels 1, 3 and 5 at the same time you start the bonus round. You have three chances to roll the dice. (Throwing a double will give you another extra roll).The number you throw will be multiplied by your bet to determine your prize. In addition to that prize, if you roll a 7, two times in a row you will receive 20 times total bet on top of your prize. If you roll 3 times a 7 in a row, you will receive 200 times total bet on top of your win! Try it this weekend at Fly Casino! Play 300 Monday! From 00:00GMT until 23:59 GMT, all members on their first deposit of $/£/€40 or more will receive a $/£/€60 bonus. Claim it three times to play with 300.00! On Tuesday from 00:00GMT until 23:59 GMT, all members on their first deposit of $/£/€30 or more will receive a 125% deposit bonus up to $/£/€125.00.